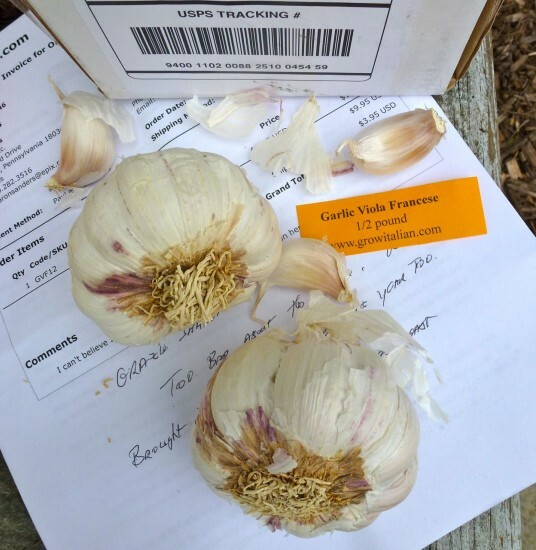 Garlic bulbs imported by Seeds from Italy. Back in September, I opened the Seeds from Italy promotional email in my Inbox. The company is the exclusive U.S. distributor for Franchi Seeds. “Four garlic varieties have just arrived from Italy. Ready to plant now,” the copy proclaimed. Since I had been savoring fresh garlic from the Farmers’ Market for weeks, I was intrigued with the concept that I could grow my own. Like daffodil bulbs tucked below ground in autumn to bloom seemingly like magic in spring, I could sow garlic cloves in September for a (practically) effortless flavor bonanza next spring and summer. My kind of gardening. I knew right away that I wanted the Rossa di Sulmona with its plump bulbs wrapped in mauve tinged skin. I guessed that maybe this variety had been cultivated in Sulmona, a charming town in Abruzzo, which rendered it even more appealing. I made a mental note to order some. Wild and beautiful coasts are always close in the region of Puglia. Hollywood celebs Justin Timberlake and Jessica Biel married this weekend at the luxury Borgo Egnazia resort in southeastern Italy. Eonline quoted a statement from the newlyweds issued by People magazine which apparently has a lock on the coverage. People’s print edition will publish exclusive photos this week. 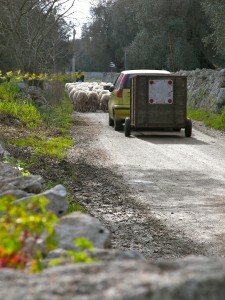 Traffic on a country road in Puglia. 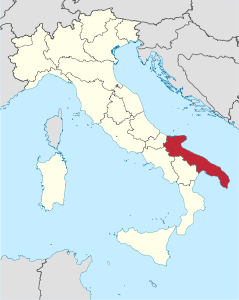 Puglia, in fact, resembles Florida in that it’s a peninsula jutting out from the mainland mass of Italy. It’s the heel of the boot. Walter and I traveled by car through the region three years ago. We marveled at the oceans of olive tree groves, the many wine vineyards, the conical stone trulli, the stunning wild beauty of the coasts (on three sides), Spanish baroque architecture in Lecce, the purity of the cucina and the genuine hospitality of the locals. 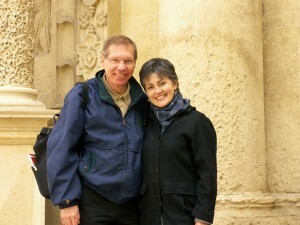 The happy couple Walter and Sharon (sorry, Justin and Jessica) in the Spanish baroque city of Lecce in Puglia. If I had access to Justin and Jessica, I’d compliment them on their choice of locale for the nuptials and asked them how they chose it? Had they visited there previously? Walter thinks that avid golfer Justin may have been drawn to the links at Egnazia. Good selection, I’d say. And if brings more people to know and appreciate this distinctive ancient place, that’s worth celebrating. 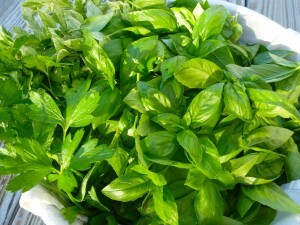 Pick tender basil leaves and flat-leaf parsley early in the morning when it's cool. Now that there are several pounds of peeled, quartered local peaches tucked into the freezer, I can turn my attention to making basil pesto. 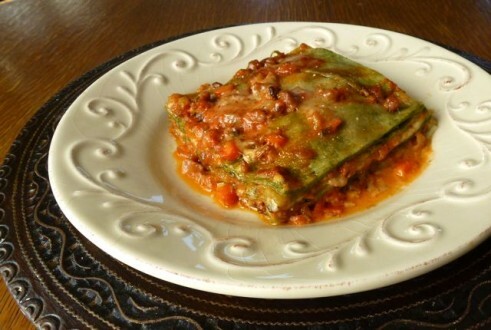 I hesitate to call it pesto alla Genoese (literally Genoa-style paste) because the purists are rigorous that the ingredients in this renowned condiment be basil and olive oil grown only in the region of Liguria. There’s even a Consorzio dedicated to its preservation. Another issue is the grinding method. In Liguria, traditionalists crush the tender herb leaves, garlic, and pine nuts in a marble mortar with an olive wood pestle. In his book Recipes from Paradise: Life and Food on the Italian Riviera, Fred Plotin writes, “A mortar and pestle mashes while the food processor or blender grinds. The flavors of herbs and nuts, their oils and essences, are released in a unique way that cannot be equaled in a machine.” He does go on to say that many cooks in Liguria use a blender but acknowledge that the pesto is not as good. I priced a 7-inch-wide marble mortar and pestle on the Williams-Sonoma store site. At a cost of $99.95, I don’t think it’s going to be in my kitchen anytime soon. Less expensive rough granite models exist—from Mexico and Thailand—so I’ll be on the lookout for a good buy. Adding salt and flat-leaf parsley helps to lock in the green color of the basil which can brown if handled roughly. For now, however, I need to pick my basil before it goes to flower. I’ll make a double batch of pesto alla Pennsylvaniana. In January, it will taste like heaven even if it’s not quite Ligurian. Poaching the garlic makes this pesto mellow but using raw garlic cloves is the classic choice. In a glass measuring cup, combine the oil and the garlic. Cover with waxed paper. Microwave for 30 seconds. Reduce the setting to low; microwave for 1 minute, or until bubbly and fragrant. Allow to cool to room temperature. In a food processor, combine half of each of these ingredients: the basil, parsley, pine nuts, salt, and garlic oil. Pulse 20 times or until coarsely chopped. Scrape the sides of the bowl. Process for about 2 minutes or until a coarse paste forms. Transfer to a mixing bowl. Repeat with the remaining ingredients. Transfer to the bowl. Stir in the Parmesan and the Pecorino Romano. Flash-freeze dollops of pesto on a tray before packing into air-tight plastic freezer bags or other containers. 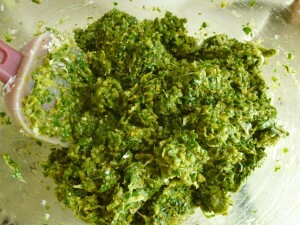 Use a serrated knife to cut off the amount of frozen pesto you want for a recipe. Spoon the pesto in mounds (1/4 or 1/2 cup are convenient amounts) onto a plastic wrap-lined tray. Place in the freezer for several hours, or until solid. 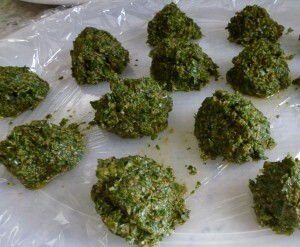 Transfer the pesto mounds to a plastic freezer bag. Return to the freezer for up to 6 months. Pasta with Basil Pesto: Cook 1 pound pasta until al dente. Reserve 3/4 cup cooking water. Drain the pasta and return to the cooking pot. Add 1/2 cup of frozen pesto and enough of the water to moisten the sauce. Season lightly with salt if needed. Note: Because I grow basil and parsley without pesticides, I never wash it but rather wipe off any visible dirt with a paper towel. If you feel you must wash the leaves, dip them gently in cold water and pat dry before making the pesto. 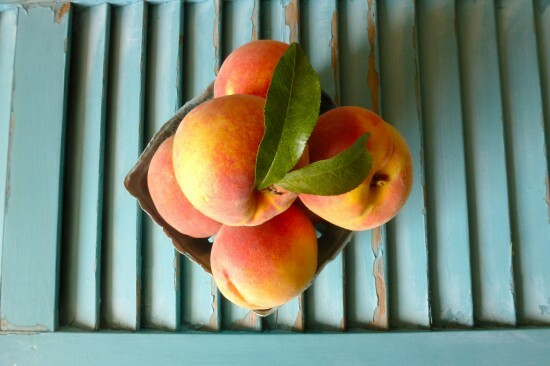 Italians wait patiently until the moment is ripe for perfect peaches. My daughter Tess used to think she didn’t like peaches. But when she was nine and visited Italy, she changed her mind. We bought some lush peaches at the most charming frutta e verdura, “fruit and vegetable shop,” I had ever seen. The shop exterior was, appropriately, painted exactly the rosy blush color of a ripe peach. Folk art paintings of fruits and vegetables graced the windowpanes. As we strolled by, the scent of peaches beckoned us, like those visible aromas that tickle the characters’ noses in cartoons. Inside the shop, the lettuces, radicchio, scallions, strawberries, cherries, onions, and peaches were arranged in an edible tapestry that would have impressed Martha Stewart. Within moments Tess was in heaven, sweet golden juice dripping down her chin, eating a wondrous peach out of hand. A day or two later, as we finished our midday meal at a family-run trattoria—not a fancy place at all—I wasn’t surprised when Tess ordered a fresh peach for dessert. 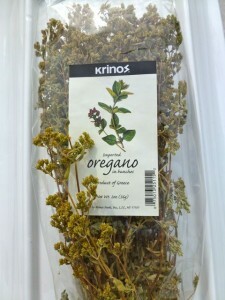 Dried oregano from the Mediterranean surpasses all others. Conventional cooking wisdom dictates that fresh herbs are always preferable to dried. A generation ago, you might find fresh parsley in the supermarket produce section, but that would be it. Today, fresh herbs crowd an entire section and “gourmet” recipes demand the just-picked stuff. Some fresh herbs are, indeed, superior to their dried relatives a few aisles away. Basil is the most obvious example. It shares its subtle anise-mint flavor only when it’s newly plucked. But oregano? I don’t agree with the trend to cooking with this herb before it’s dried, especially if it was grown in a hot house or hydroponically, as so many commercially-grown herbs are. Oregano, in Italy, is the Neapolitan pizza herb. For making the finest pizza at home, the type of oregano you choose makes a dramatic impact. 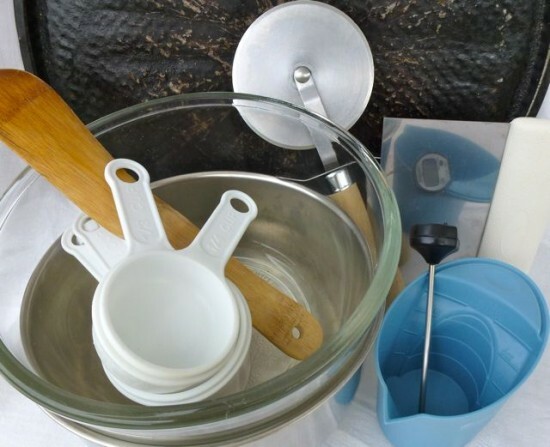 Store your pizza-making tools in a designated cupboard or drawer so they're ready to roll when you are. Pizza is simple and fun to make at home, although the owner of your local pizza joint would like you to think otherwise. You can shape the crust as thin or thick as you like and top it with Italian San Marzano tomato puree, Mediterranean oregano, true mozzarella di bufala and other high-quality condiments. These ten essential tools are the minimum battery you need to create wonderful pizza right in your own kitchen. If you get hooked, you’ll find plenty more pizza-making toys—from ceramic stones to wood-burning ovens—to tempt you. The class liquid measure looks like a small pitcher with a handle on the side and measurement lines painted on the side. It accurately gauges the amount of warm water or other liquid without it running over the top of the cup as it would with dry ingredient measuring cups. These measures are available in silicone, plastic, glass and metal. Newer designs can be read by looking down into the cup instead of bending to look at it sideways. Be sure to choose one with a pour spout. This handy tool takes the guess work out of determining when the temperature (105°F to 115°F) of the water is just right. If the water is too cold, the yeast won’t activate. If the water is too hot, the yeast will die.